Bongeunsa Temple in Seoul is one of South Korea’s most revered national treasures. The temple’s establishment is believed to be over 1000 years old. It is one of the most extensive temple grounds in the country with beautiful structures and natural environment. Locals and foreign visitors flock here especially during Buddhas’ birthday and other special religious events. However, many visitors and pilgrims also prefer to come either to pray or simply enjoy the site outside the busy periods. I have recently explored the temple area and got very excited to have seen it with my own eyes and felt the serene surroundings despite the busy business activities around. 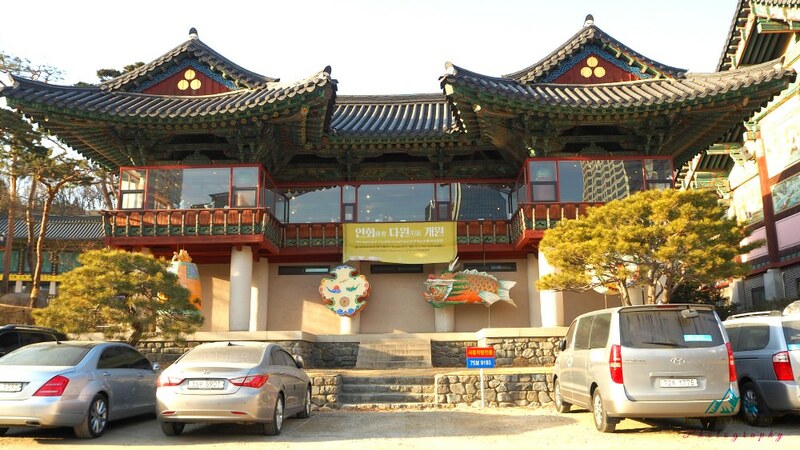 Let me introduce to you this place with my limited experience and knowledge about this Buddhist temple (I had actually participated in the meditation lessons when I first arrived in Korea ^^). FACTS: Bongeunsa Temple is over 1,200-year-old temple ground and has played significant roles is promoting Korean Buddhism. It was built in 794 and were renovated after it suffered fire devastation. Bongeunsa Temple was once known as Gyeonseongsa Temple. I was told that the temple area used to be much bigger than what it is today. The present COEX building area was once part of the temple area. 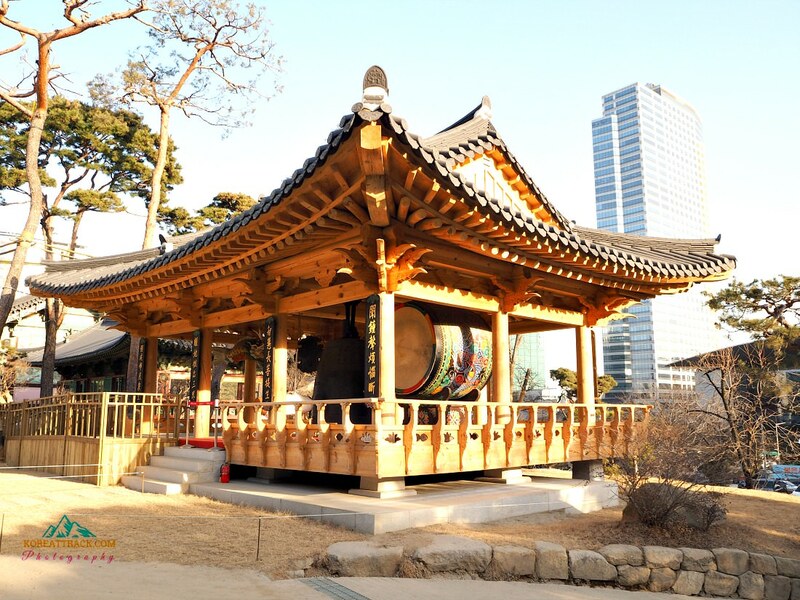 The temple was believed to be constructed during the 10th year of Shilla Kingdom’s King Weongseong’s reign (794). It was founded by national master Patriarch Yeonhoei. Through Bongeunsa’s establishment, it became the cornerstone of Korean Buddhism’s revival. In particular, through Venerable Bowoo’s devotion to this work, Bongeunsa became a head temple of the Korean Seon (meditation). 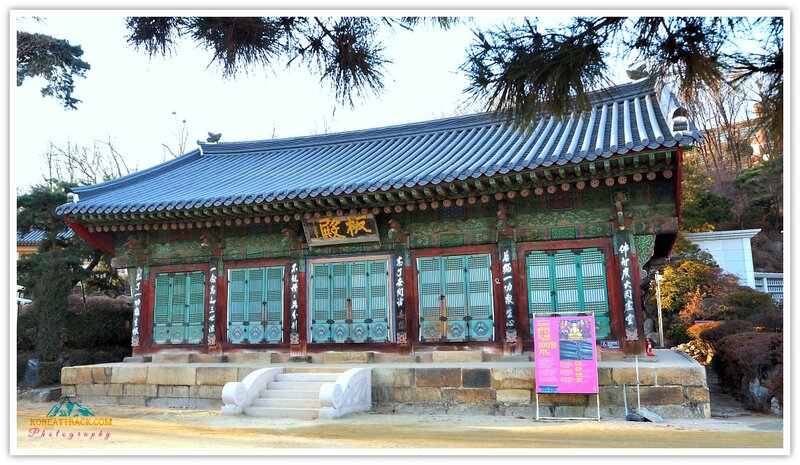 Queen Jeonghyeon in 1498 did renovations of the temple and changed its name from the original Gyeongseongsa Temple into Bongeunsa Temple. 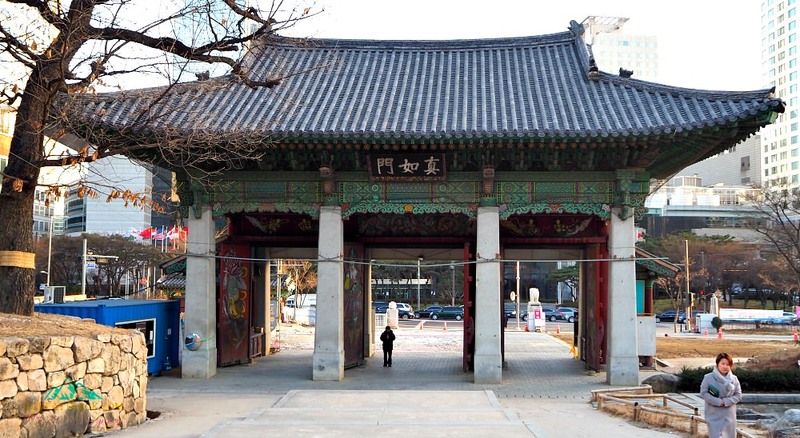 The temple was initially located near the Royal Tomb of King Seongjeong but was moved to its present location during King Myeongjong’s Joseon Dynasty king. ‘Seunggwapyeong’ (literally: qualification exams) is a national examination for monks used to be held where the COEX is currently located. Bongeunsa is home to over 3 thousand Buddhist scriptures of 13 types. These scriptures include the works of the famous monk Kim Jeong-hee. Kim is a great scholar and calligrapher and successfully wrote his own calligraphy style called the “Chusachae,” a calligraphic style named under his pen name. An annual ceremony called Jeongdaebulsa is performed by a march with monks carrying the scriptures on their heads while reciting the rites (Beopseongge). The ceremony is performed on the 9th day of the 8th month of the lunar calendar. 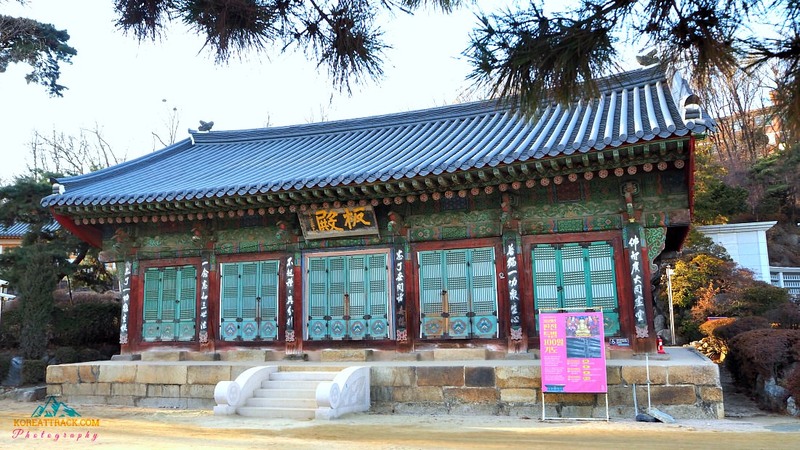 Venerable Yeonggi of the late Joseon Dynasty built the Panjeon where 81 volumes of the wood blocks of the Avatamsaka Sutra are housed. At present, Bongeunsa keeps playing a significant role in spreading Buddhism through its practice-oriented approach. Its activities accommodate not only domestic but also international guests, thus spreading Buddhism throughout the world as well. Now, if you are not a Buddhist or a follower, let me ask you this question: Why would you visit Bongeungsa Temple? Personally, I have a number of reasons why I would visit (or visit from time to time) the temple. First, I should that I love the way religion and art are being put together in one place. I mean, Buddhist believers (including monks) are able to express the beauty and goodness of what they believe in through physical or tangible expressions—such as temple structures and colors, paintings, Buddha statues, calligraphy, tea ceremonies, and all that. Second, I feel the sense of peace and healing when in the area. There is something in the tranquility that I believe (personally) every human beings (and animals?) should live with or experience. Whether you agree with me or not, there is always something in every religion that makes me feel more human and that life is worth living and preserving. It has beautiful garden areas and pretty pine trees, sculptures, etc. It has a newly-build tea house where you can freely try their generous offer. Moreover, maybe you want to learn a bit about this religion: its history, practices, etc. Whatever your reasons may be, it is a good place to be, and I’m sure you won't’ regret it if you do. Now, let me introduce to you the most important buildings within the temple area. I believe it is worth learning a bit about their background and functions. It is the structure that greeted with its majestic and imposing sight as I approached the area. It is the main entrance of the temple’s compound. Dissecting its words: jin-yeo-mun means ‘as it is’ or as it truly is. ‘jin’ is true (truth or real) and ‘mun’ means gate. It is called this was because the monks (and believers) believe that those who enter through this gate will be entering to search for the ‘Real Truth’ without any discrimination (yes, I know that’s heavy!). It is the Dharma Hall. The name “Beopwang-ru” literally means the ‘Pavilion of Dharma King’ –that is, the Buddha. 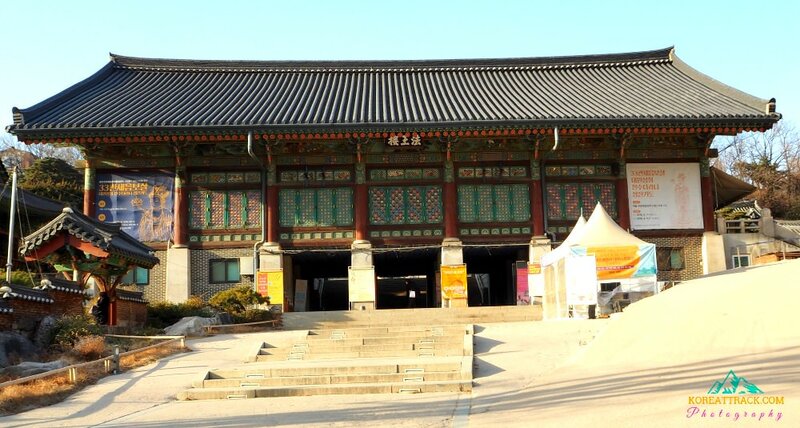 It is facing the Daeungjeon or Daewoongjeon (Main Buddha Hall) where various religious ceremonies are performed. There are over 3 thousand (3,300 to be exact) statuettes of Avalokitesvara, the Bodhisattva of Compassion being enshrined inside this hall. This is a designated Tangible Cultural Property of Seoul (No. 64). 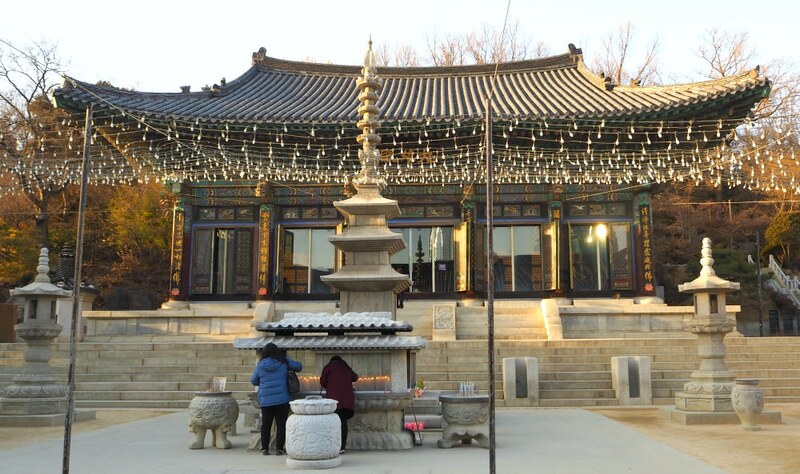 This was built by Master Monk Ilcho Taewook in 1941, two years later when a massive fire engulfed most of Bongeunsa Temple in 1939 (except the Panjeon). Seonbuldang is specially built original style Paljak roof with six gables. It is also known as a great place to pray and attain enlightenment. It is where big Buddha statues are enshrined and where main ceremonies and prayers are offered. Statues of wooden sitting Buddhas inside are designated as national treasures. Sakyamuni Buddha is the one in the center, Medicine Buddha on his left, and Amitabha Buddha on his right. Right behind the three Buddhas, you will see a beautifully painted artwork which portrays each Buddha. It is called the “Disciples Hall” that enshrined the statue of the Sakyamuni Buddha, with other statues and 16 Arahants. Buddha and guardian deities paintings are also housed inside. Buddhists believe that Arahants have supernatural powers and would quickly respond to the wishes of those who pray to them. (I peeped inside thinking of taking one shot but had no opportunity. Taking photos is usually not allowed especially if you have no permission). Both Bukgeukjeon and Yoengsanjeon were rebuilt in 1942. 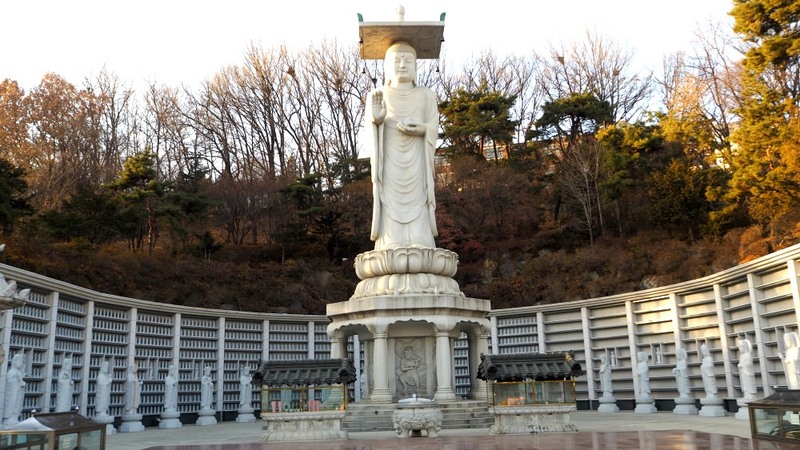 Bukguekjeon enshrines the Big Dipper, the Mountain Spirit, and the Hermit-Saint. In particular, the Big Dipper’s seven stars are regarded as the god “responsible for health, longevity, wealth, fertility, and a good harvest. Traditional beliefs were adopted by Korean Buddhism. It is the Great Statue of Maitreya Buddha structure built by Master Yeongam (from 1986 to 1996). It is a 23-meter high statue and the tallest stone statue in Korea. In front is a vast square where people can pray and where cultural events and activities are carried out. It involved over 10 thousand Buddhist monks, nuns, lay people to work together to have this statue came into being. Built in 1855 by Venerable Yeonggi and scholar-calligrapher Kim Jeong-hee, it is designated as Tangible Cultural Property of Seoul. Panjeon enshrines 81 volumes of the Avatamsaka Sutra engraved in wooden blocks. At present, 3,438 wooden blocks are being housed here. 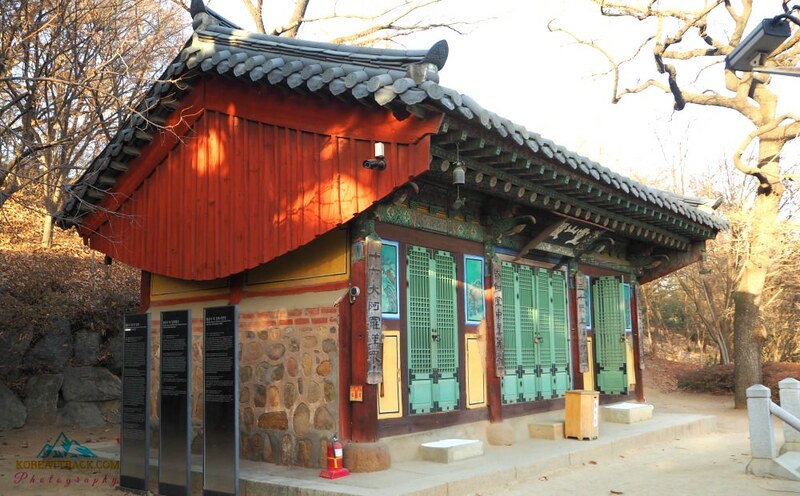 Among the buildings of Bongeunsa Temple, Panjeon is the oldest one and houses the Vairocana Buddha. It is the bell pavilion of the temple. You can see four sound instruments: a Dharma Drum, Wooden Fish, Cloud-Shaped Gong, and Dharma Bell. Before the ceremonies at dawn and in the evening daily, these instruments are struck to wish for the salvation of all beings. It is the statue of Avalokitesvara Bodhisattva of the lotus pond. It is a Bodhisattva of compassion. This pond represents one of the nine ponds in the Paradise of Amitabha Buddha. It is believed that Avalokitesvara Bodhisattva hears and sees all sufferings and intends to save all sentient beings. 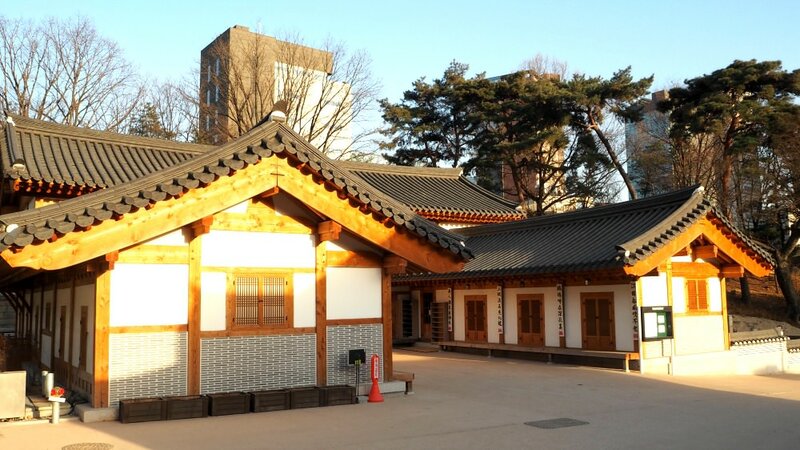 The teahouse’s name came from the national Master Patriarch ‘Yeonhoei’ who founded Bongeunsa Temple in 794. ‘Yeon’ means to create a better relationship, ‘hoei’ means to meet (or a meeting), and ‘dawon’ means a tea house. This new structure was opened on 20th June 2018. It is open to all from 9:30 AM to 9:00 PM. Bongeunsa Incense Burner and three wooden statues of Buddha are designated as national treasures. The Hanging Board of Panjeon by Kim Jeong-hee and other 19 works are designated as tangible cultural properties of Seoul. Other treasures include the painting of Sakyamuni Buddha’s feet, Sutra of Buddhist Rosary, and others. It seems that it is obviously a place for people who are believers of Buddhism or inclined to learn more about this great religion. However, as I hinted above, it the temple welcomes everyone who comes and takes a look around. Children? Yes, children are allowed here (as most of you know or have guessed already). It is a right place for kids to see religious symbols, structures, or maybe talk with some monks? But make sure silence is being kept when exploring the temple ground—there is always somebody meditating or praying on one of those temples. To share the traditional culture and other values of Buddhism to all, Bongeunsa Temple offers various activities to all interested guests. On the other hand, a Templelife is a day program that gives you an opportunity to experience traditional Buddhist culture, shorter than Templestay which takes two days and a night. From 7 to 30 domestic and international guests can participate in the program. Temple tour, tea ceremony, monastic meal, yebool, copying Sutra in Golden ink, cham-seon meditation, conversation with a monk/nun, 108 prostrations, among others. Basic Programs could take 2 hours and starts if there are 7 persons or above registered. I am just trying to help anyone who is willing to learn about their program. Bongeunsa Temple is at the heart of Seoul. Therefore, you can expect that various business centers and facilities are readily accessible in the area. Hotels and other types of accommodation are available if you choose to stay around the area. Note that the area is a bit more expensive than any other places in Korea. That’s because business centers, offices, financial institutions, luxurious apartments, among others are entirely developed in the area. View from Bongeunsa of skyscrapers - 63 Building, Intercontinental Hotel, etc. Most major places are accessible on foot and wheelchair facility. Usually, there are no sitting areas inside the temple grounds. Sits are only provided to visitors during special occasions and events. 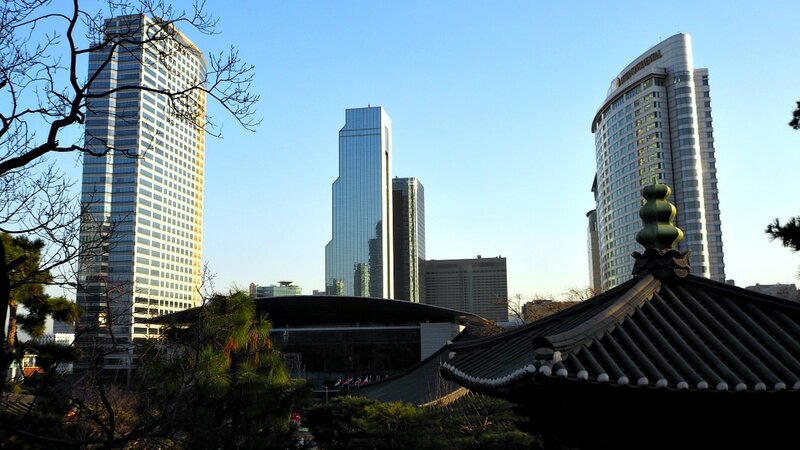 It is effortless to get to Bongeunsa Temple by taking public transports: Bus and Subway. I took Line 9 and got out from Bongeunsa Station Exit 1. This I think is the shortest walk to the temple. Overall, it sounds like the place is a good place for all who are willing to learn about this religion and for those who have open minds and hearts to anything that is good in the world. Besides, the whole place is beautiful and a treasure that is worth your time and energy for a visit.